The theme for this year was Fall in Love with Howell. Guitarist Lou Coppolino provided the entertainment during the cocktail hour. At 7pm the attendees moved into the dining room followed by a modern dance to Elvis Presley’s song Can’t Help Falling in Love With You performed by Rachel Falcone, a student in the dance program of FPAC, Howell High School, and sung by the Rebel Yell of Howell High School. The Rebel Yell also sang the Star Spangled Banner. The Rebel Yell is overseen by Director Mr. Joe Cantaffa of Howell High School. Pure Energy DJ Entertainment provided the music for dancing. Mike joined the Howell police force in 1995 and is currently the resource officer at Howell High School. Mike has volunteered his time to many organizations, most recently with the Frances Foundation where he met 8-year-old Howell resident Jake “The Tank” Honig who died of cancer this year. In 2017 Mike was named officer of the year by the Howell Township Police Department’s Chief Andrew Kudrick and has received awards from Chris Hill for his collaboration with the Howell PAL. Howell Township is grateful to have Mike Pavlick as one of our finest. Stop & Shop, their promise of being a Better Neighbor means contributing to the well-being of the communities where they do business. Store Manager, Alan Sunday is always available to help the community in any way they can. 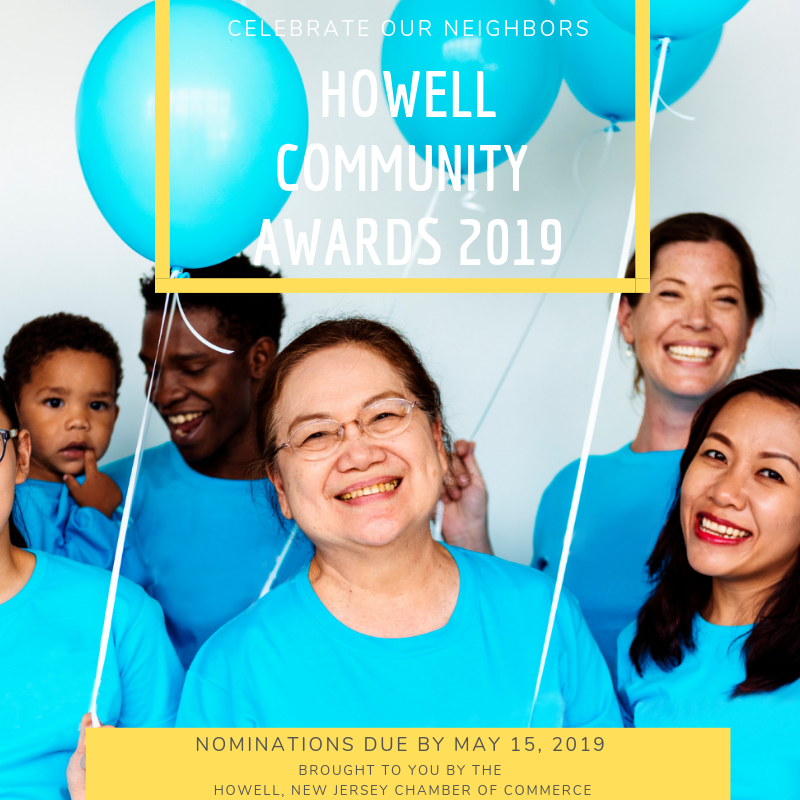 A few examples of their contributions are National Night Out entertainment sponsor, 5 K “Race to Educate” sponsor, supporters of Howell Little League and Howell soccer clubs. Stop & Shop holds an annual FFF (Foods for Friends) campaign. and adopts the Howell Food Pantry and Monmouth County Food Bank. Recently, District 331 participated in the Making Strides Against Breast Cancer Walk in Point Pleasant Beach, NJ. This was Stop & Shop’s 8th year as a Flagship Sponsor! They were also the supplier of product for the refreshment tent open for everyone once they completed the walk. Over 20,000 people in our local community attended this event. Thank you, Stop & Shop, for being such a good neighbor. Since 2016, OnTrak Solutions, LLC provides state of the art technology for vehicle tracking, dash cameras, asset tracking and everything telematics. In the two short years of being in business OnTrak Solutions has accumulated clients nationwide of all sizes in every industry, from Construction, Municipalities, Long Haul Tractor Trailers, Towing Field Services and Health Care. They are dedicated to the communities they serve across the state of NJ, supporting local police and fire departments as well as many nonprofits. Howell Township is fortunate to have this Shining Star Business in its backyard. Minister Steve Brigham created “tent city” for the homeless which originated in Lakewood. Minister Steve ran the camp for 12 years and created enough awareness that charitable donations from a variety of sources provided for the basic day to day survival needs of the residents living there. Minister Steve has lived in the camp for 4 of the 12 years. In 2017 “tent city” was relocated from Lakewood to a Howell township property for a temporary location until the land was sold, which it was in July 2018. Minister Steve Brigham strives to create his dream community Destiny’s Bridge. He envisions a world that goes back to natural renewable systems and a society that allows for the back to basic sustainable way of life. Thank you, Minister Steve Brigham, for helping those in need and bringing it to the attention of those living in Howell. Service Organization of the Year: Fighting H.A.R.D. Fighting H.A.R.D. organization was established in 2015 after the parents of Alexandra searched for a foundation that their daughter could be a part of where people understood what she was going through. When they were unable to find one, they decided to create an organization of their own where they could bring children of the rare disease community together to help them know they were not alone in their battle by raising awareness and funding for programs that would help make HARD life a little easier. The heart and soul of the organization are the two sisters who fight HARD every day. Since his early twenties John has devoted his time to giving back to the community in which he lives in. In his early 20's, he joined the Hamilton 1st Aid Squad. The family moved to Farmingdale in the early 90's, where he then joined the Farmingdale-Howell First Aid Squad. He has been with the Farmingdale squad for over 25 years and was elected Captain twice, once in late 90's and again in 2010. To this day, he still remains Captain. He has also been EMS Track and Safety Coordinator for Wall Stadium Speedway since 2000 as well as for Len Sammons Indoor Motorsports since 2003. He works very closely with the NJ State police and oversees EMS operations and training for all racing events. He doesn't stop...Nothing gets him down...With a great sense of humor and positivity, he's always willing to help out when and wherever he can...Most of which you can follow on his up-to-the-minute Facebook feed! The Awards Dinner requires yearlong planning under the direction of Chamber President Tom Comer of Lomurro Law and Chairperson Liz Romanowski of PNC Mortgage. Committee members include Patty Fallon of The Ivy League, Liz Reilly of Weichert Realty, Eileen Solaz with Stars News Group, Sara Andreyev of OnTrak Solutions, LLC, Jenn Weisert of Manasquan Bank and the MC of the evening, Martin Saltzman of AFM Investments. The Howell Chamber of Commerce thanks the local businesses that donated items for the silent auction, to the sponsors of the event, and family and friends that placed congratulatory ads in the journal.